The Megaflo unvented cylinder brand is owned by Heatrae Sadia which is a leading name in water heating technology. The company has over 95 years of history in electric and hot water storage which is reflected in the wide range of products they offer. Heatrae Sadia acquired Megaflo in 1993 and has grown the brand to the point where megaflo or megaflow is often used as the general term for unvented cylinder. Heatrae Sadia are now owned by gas boiler manufacturer, Baxi, which in turn 2009 merged with European heating company group, De Dietrich Remeha. This is now known as the BDR Thermea Group and has a presence in over 70 countries. The Megaflo is the market leader when it comes to unvented hot water cylinders and the Megaflo Eco is the flagship range. They are renowned for high quality design, reliability, easy maintenance and powerful hot water delivery. A key feature of the Megaflo Eco is the fact that it doesn’t have an external expansion vessel as many cylinders; this means a more the compact design and simpler installation. As an unvented cylinder the Megaflo takes its water supply directly from the mains delivering a high flow rate, powerful showers and fast-filling baths. 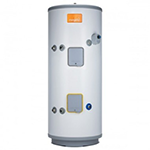 The cylinder is available as both a direct or indirect model which means it can be heated by a boiler (indirectly) or an immersion heater (directly). In addition to the standard Megaflo Eco, Heatrae Sadia have designed a range of other cylinder options to suit every type of home. This includes cylinders suitable for solar PV and solar thermal which can harness solar energy to produce hot water. For homes with limited installation space the Megaflo Eco Slimline is a taller but slimmer option and households with a particularly high demand for hot water may want to consider the Megaflo Eco Plus. Megaflo Eco 70, 125, 145, 170, 210, 250, 300 B or C (depending on capacity) Megaflo’s flagship unvented cylinder with an internal expansion vessel. Megaflo Eco Solar PV Ready 170 (indirect only), 210, 250, 300 C This cylinder can harness surplus energy from a solar PV system to reduce your energy bills. Megaflo Eco Slimline 100, 125, 150, 170, 200 B A taller but slimmer version of the Megaflo Eco for homes where space may be limited. Direct: 250, 300, 400, 500, 570, 800, 1000 C Delivers twice the flow rate of the Megaflo Eco up to 176 litres per minute for homes with high demand. The indirect model is also available with solar compatibility. Direct: 170, 210, 260, 300 C For use with Megaflo’s solar thermal package which uses solar energy to heat your water. Direct: 260 C Pre-fitted with the components needed for a solar thermal system to simplify installation. Megaflo Eco SystemFit 125, 145, 170, 210, 250, 300 B or C (depending on capacity) Designed to be installed with a Regular boiler and pre-fitted with all necessary components to simplify installation. Megaflo Eco SystemReady 125, 145, 170, 210, 250, 300 B or C (depending on capacity) Designed to be installed with a System boiler and pre-fitted with all necessary components to simplify installation. Megaflo Eco Plus Flexistor 400, 500, 570, 800, 1000 B or C (depending on capacity) Flexistor cylinders are designed to suit a range of systems for flexible installation. Heatrae Sadia also produce a range of vented cylinders called the Megalife HE and Megalife Solar which need to be fed cold water from a feed tank in a loft space. All Megaflo cylinders include a Domestic Lifetime Warranty against corrosion for the lifetime of the owner. However, this warranty only covers the cylinder vessel itself which is made from Duplex stainless steel. The other components such as the valves, immersion heater and controls are covered by a 2 year warranty including parts and labour. The only exceptions to this are the cold water combination valve and hot water expansion vessel (if the cylinder has one) which are covered by a 5 year warranty. The cost of an unvented cylinder tends to fall between £500 – £1,000 but this will vary depending on which size and model you choose. This doesn’t include the cost of installation which will vary from installer to installer. To make sure you’re getting the best price for a new unvented cylinder you should compare quotes from several suppliers. Send us an enquiry today and we can put you in touch with up to 3 qualified and reputable engineers in your area.